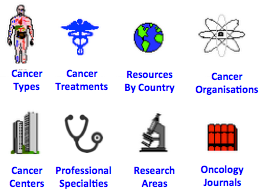 Welcome to the Guide to Internet Resources for Cancer - gateway to cancer information on the Net since 1996. This non-profit guide contains over 100 pages and more than 4,000 links to cancer related information. It is regularly updated and links are periodically verified using a link-checker. Message to New Users. There is a large amount of useful cancer information on the Internet. However, anyone can publish on the Internet and to a large extent information is unregulated so you should be aware of quality of information issues. Also, remember that health care systems, treatment protocols, clinical trails, spelling and medical terminology may vary from country to country. If you are a patient always remember to discuss your concerns and information requirements with your physician. Your physician should be able to provide you with the information which is most relevant to you. The Internet may provide you with a useful source to supplement your information, but it can also be a potential source of confusion and frustration; see Steve Dunn's Pros and cons of researching your cancer.